Hi lovelies! I realise that talking about laundry isn’t the sexiest way to get your attention, but if you don’t know why you need a Spindel in your life, allow me to elaborate (If you are based in the Western Cape you’ll appreciate this giveaway particularly since it was so wet yesterday). The Spindel is the energy and pocket friendly solution to any wet weather laundry woes. Its a mobile appliance that is small enough to be tucked into your broom cupboard but big enough to hold up to a 6.5kg washing load (that’s 4 king size sheets) – and what it gives you in terms of time and electricity costs saved is pretty brilliant. If tumble drying costs are killing you and if your line dried clothes are taking forever and a day to actually dry, then this nifty machine is for you! Want to WIN a Spindel? • Leave a comment below and tell me why you need a Spindel in your life and which one would work for you? I would love a 6.5kg Spindel — we have 7 people’s washing to handle – it doesn’t all get dry even with our wonderful Highveld sunshine – this baby would help us so much! Please can I win one of these as I have a guesthouse so there are loads and loads of linen and towels to be washed each day. Then dried and sometimes the towels need to be back in the bedrooms on the same day. If I win I will recommend that all guest houses in my network acquire one. Because apartment living with only a small area to hang washing and no space for a tumble dryer! The 4.5kg Spindel would be ideal. 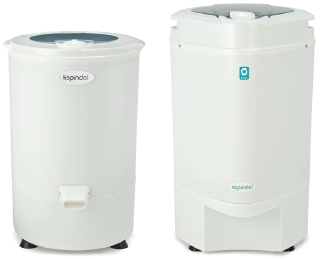 I would absolutely LOVE the 6.5kg Spindel as it would make my wash day blues go a LOT faster, I am a full-time working mom and i do not have a domestic worker. Doing the washing in the winter is an absolute nightmare for me, trying to dry my little one’s school clothing makes me want to pull my hair out of my head……I end up starting my washing on a Saturday morning and by Sunday evening i have our clothing draped all over the house STILL trying to dry it, a tumble dryer is just not a possibility in our house due to the high cost of electricity. This would be an absolute dream come true. How to win a spindel? Spin a special spindel yarn? Dance and spin and twirl! And spin a spindel round the world. Will I win a spindel? 5kg one for all the washing I’m currently doing with a 2 week old baby and a busy 3 year old toddler. My husband is one of those who doesn’t make it with his clothes to the laundry basket go before I know it he has his own pile that keeps ne busy too. Just yesterday I think the tumble drier and washing machine was on the whole day until after supper so today I have a mountain of clean washing to fold and get through. A spindle will change my life for the better and make me embrace the new season I’m in with grace and dignity hehe. I feel like thus would change my life!! Need the 6.5kg one for all the washing I’m currently doing with a 2 week old baby and a busy 3 year old toddler. My husband is one of those who doesn’t make it with his clothes to the laundry basket go before I know it he has his own pile that keeps me busy too. Oh my! I need a spindle 6.5kg please! I live in a small little cottage with no space for a tumble dryer, this will be the only way I can get my clothes dry in the rain or cold! A 6.5kg spindle would change my life! No more chasing the sun with my clothes rack….waiting an entire week for clothes to dry in winter. Not to mention the savings on electricty. I need one in my life! I’d love a 6.5kg Spindel! I don’t have a tumble dryer and it’s always impossible to get clothes and bedding dry in winter. This would help a lot! Oh my I have had my eye on one of these for years but the budget just won’t budge. It will solve my weekly nightmare in winter to get my clothes dry without every surface in my house being littered with laundry for days on end. Wich also leaves the laundry with that “wet for too long” smellies. Would simply adore one. Hard after moving out after separating and yet to afford a washing machine, but once I do get one, that spindle would definitely help so much! Babie’s clothes will be dry!!! Would love the 6.5kg one – getting newborn clothes dry in winter is a real challenge! At this point, proving to be more difficult than the actual baby! This would really help solve the problem of constant sour milk smelling clothes! I would love any sized spindel. I have a 2 month old baby and have laundry every single day, a Spindel would help me get the little one’s clothes dry in no time. 4.5kg will be perfect for my very small apartment. I don’t have a space to dry my washing and it tends to get all over the flat and that makes me sad. Please make me less sad . What a dream a 6.5kg Spindel would be! At the moment, the only flats I can afford to rent have no outdoor spaces to hang up laundry, and often, the ventilation isn’t great. A Spindel would make life (with my washable feminine hygiene products, t-shirt fabric replacements for cotton wool face pads, handkerchiefs and other laundry) that much easier. I’m becoming an auntie soon for the very first time and I know how much my sister will love this 6.5 kg spindel… If I could I would purchase one for her myself. I just want the best for my sister and her soon-to-be born son… this will be a wish come true. I would do my nut for the bigger 6,5kg one. I’d love to win a spindel – either size would be great- to give to granny! She battles with her current washing machine and this sounds so incredibly easy and quick, not to mention very cost effective! Hope to be a winner! Holding out for major rains in cape town for the rest of this dry winter, and when they come I’ll be ready with a spindle! I would so love to be the lucky winner of the family sized 6.5kg Spindel. With a full day at work and 2 school going kids, there is always unplanned dirty school clothes…the nightmare of getting it dry by the next day is one i can do without! I would love to win the 6,5kg Spindel so that I can dry even more washing twice as fast! Ideal for drying cloth nappies quickly too! Brilliant product! LOVE! The 6.5kg Spindel would go down a treat in our busy household!! I have 3 busy daughters that are forever climbing, running jumping and changing in and out of clothes all day long! What a life saver the Spindel would be in my life! Spindel! Yes Please.. how amazing does it sound. Would love a 4.5kg one for the small stuff that takes up the most space on the washing line/dry rack! This would be totally amazing to win as my washing machine is so old and constantly needs repairs. A spindel will definitely make a huge difference to saving costs on electricity and water. With December holidays around the corner and family and friends coming down to visit, this would lessen the stress knowing that I have an awesome spindel to take care of the loads of laundry. The 6.5kg spindel will be ideal. well after our rainy weather last weekend and having to tumble dry the washing and seeing how much electricity i was using, would give my eye teeth to win a spindel…this is an amazing prize….holding fingers and toes….